The US State Department says it has been issuing guidelines for US citizens stuck in Yemen on how to leave the war-torn country, but the 20 Americans evacuated by Russian planes say they haven't heard a word. 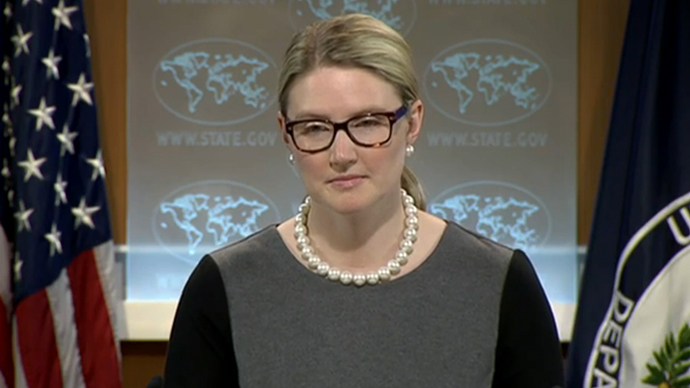 “Well, we have been collaborating for many, many weeks now,”saidUS State Department spokesperson, Marie Harf. She commented on the recent evacuation of American citizens who were among the 200 taken from war-stricken Yemen by two Russian planes on Wednesday night. The planes’ first stop was Djibouti, a tiny African country just across the Gulf of Aden from Yemen, that also happens to host the biggest US military base in Africa. Harf claimed that Washington actually has been letting US citizens in Yemen know “when there are other opportunities, talking to other countries, including the Indians and others, about how our citizens can get out." But reality turned out to be slightly different than as portrayed in Harf’s fiery speech. On Wednesday these 20 Americans on Russia-bound flights from Yemen told RT that they had been left to their own devices and had had to resort to help from private organizations and foreign governments in order to flee the country. “My cousin contacted us from the US. He got hold of the Russians and then contacted us. We only heard about it yesterday. We went from the village. It’s a five-hour ride. We crossed that bridge. Twenty minutes later a missile hit the bridge we crossed,” Mouhammed Nasser told RT’s Murad Gazdiev. One more American Yemeni Kaled Alamarie said that he has been trying to evacuate his family for the last month and a half. He tried contacting the US State Department and the White House. “Nobody really helped until recently I was contacted by one of our community members that Russian plane is evacuating American citizens. I got lucky,” he added. In early April, the US State Department said that “there are no plans for a US government-coordinated evacuation of US citizens at this time” in an official travel warning. Department spokesman Jeff Rathke explained that the people trapped by Yemeni violence were there because they had ignored the US government’s warnings. In total, Russia has evacuated more than 1,700 people from the war-torn country, the Foreign Ministry said in a statement on Friday. About 400 of them have been Russian while others came from former Soviet republics like Ukraine, Uzbekistan, Armenia and Kazakhstan, as well as other countries including France, Cuba, Serbia, Colombia and Lebanon.